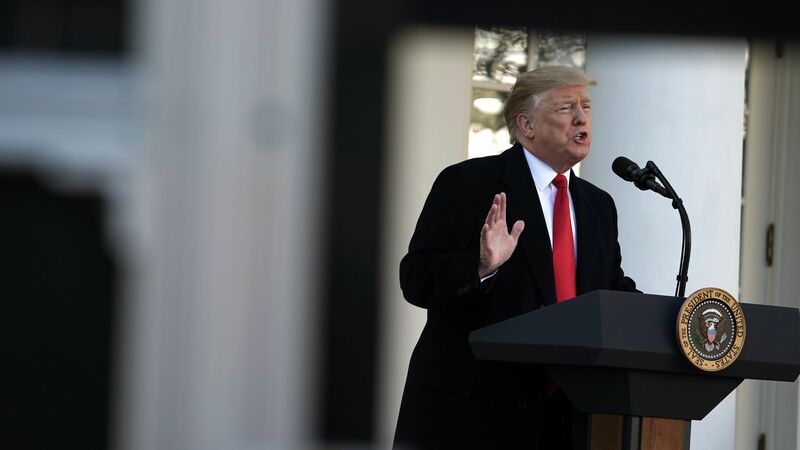 President Trump announced Friday that he would sign a temporary short-term spending bill to reopen the government until Feb. 15 — one that does not include funding for his border wall. Between the lines: While the deal includes a motion for the House and Senate to go to conference to negotiate on border security, Democratic leaders Chuck Schumer and Nancy Pelosi have made their red line clear: They will not support funding for a border wall. The short-term spending bill will lapse in 3 weeks, and barring a significant breakthrough in negotiations, the government may be headed for its second shutdown of 2019 — or possibly an emergency declaration. Senate Majority Leader Mitch McConnell: "Going forward, I hope Democrats will stay true to the commitment they have stated constantly over the past weeks — that once government was re-opened, they would be perfectly willing to negotiate in good faith on full-year government funding ... the days ahead will tell us whether my Democratic colleagues are actually serious about securing our nation; whether they actually mean what they say." Senate Minority Leader Chuck Schumer: "Today, the president will sign the bill to reopen the government along the outlines of what we had proposed... The American people do not like it when you throw a wrench into the lives of government workers over an unrelated political dispute... Hopefully now the president has learned his lesson." Speaker of the House Nancy Pelosi: "It's sad it's taken this long to come to an obvious conclusion... It’s really hard for some in the administration to understand how people live paycheck to paycheck." House Majority Leader Steny Hoyer: "While I am relieved the the President is finally willing to allow 800,000 federal employees get back to work and receive the paychecks they are due — and restore critical services to millions of Americans — it is deeply angering that he inflicted uncertainty and economic insecurity on Americans across the country for no reason for the past thirty-five days." House Freedom Caucus Chairman Mark Meadows: "[F]ailure to fund needed physical barriers along our southern border is still not an option. The President is sticking by his commitment to keep our communities safe and has assured me that nothing will deter him from accomplishing that goal… If negotiations don’t result in a solution, executive action is still very much under consideration." Sen. Elizabeth Warren: "Federal workers standing in food lines. Medical care put off. Credit ruined. Contractors who aren’t guaranteed back pay. So much suffering caused by the #TrumpShutdown, and for what? It's time to get our government back on track and working for the American people again." Sen. Lindsey Graham: "Hope Congress - in a bipartisan fashion — will work with the President and take advantage of this moment. Last best chance to take a major step toward fixing broken borders and a broken immigration system." Sen. Bernie Sanders: "How pathetic. On Dec. 19, the Senate unanimously passed essentially the same legislation that we will vote on today. We are back to exactly where we started. Thank you, Mr. President, for shutting down the government and holding 800,000 federal employees hostage. All for nothing!" Conservative commentator Ann Coulter: "Good news for George Herbert Walker Bush: As of today, he is no longer the biggest wimp ever to serve as President of the United States."